Please read the info about Nina. gl/bandaging.html (I think or try antiseptic solutions). You have to be VERY careful not to have the bandage too tight. I also question this diagnosis based on a toe alone. To tell you the truth, it is usually the whole foot pad that swells. Please read Nina's story. Your vet could be right about this though and the swelling could spread. I did not notice Nina's problems until they were severe. I managed Nina's problems for over a year. They never completely cleared up. She died from other causes and I do not think had an infected bone. Last edited by Lynx on Thu Feb 14, 2008 3:19 pm, edited 1 time in total. I can't see the pic well, but it doesn't look like bumblefoot. Some heart pigs have very poor circulation which causes swelling of the extremities. But this is one toe only, right? It sounds as if she may have damaged it. Sorry about the picture. I had my friends daughter hold her, and we put some tartan cloth over Buttercups stomach to make her foot show up better. I was later told of the macro setting on my camera, and will try to get a better picture later today when I change her bandage. 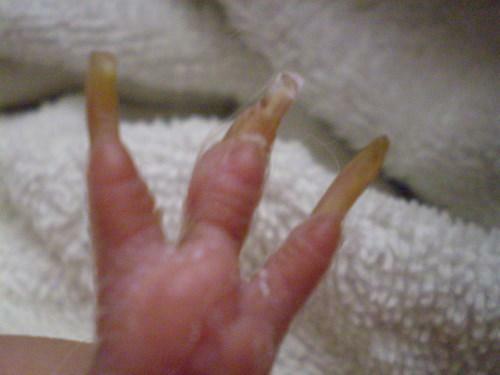 This is only the middle toe. The vet said we caught it early, and that if we hadnt other areas would swell as the bumble foot spread. She said bumble foot tends to be more common in their front feet, and the pads. I was very careful when bandaging her foot. The vet said we had to be extremely careful with the gauze as that gets up to 2 times tighter. 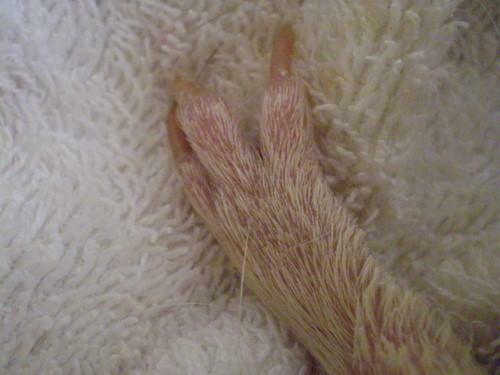 I bathed her toe yesterday in warm water and betadine and some of the crust surrounding the toe came off. I dont question the vets diagnosis. 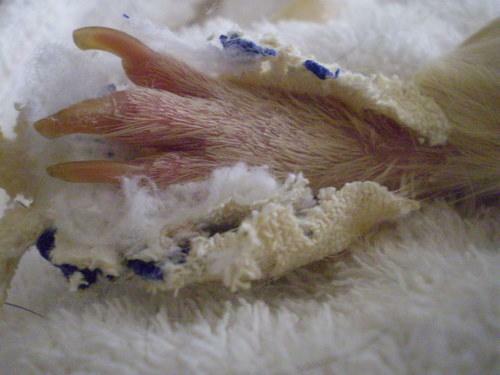 Buttercups toe was not only swollen but it also had crust around it - both symptoms of bumble foot. If she had an injury, there wouldnt be any crust. I have some fantastic pictures. 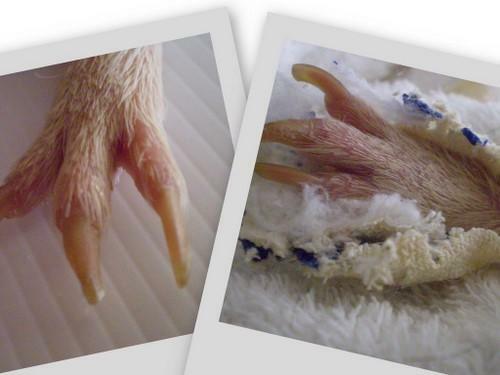 Today, the top part of her pad is slightly swollen - as is her right toe (the left toe in the last picture) compared to her other foot. After I take the bandage off, I soak her foot in luke warm water with betadine. I went to the chemist today to try and find Hibiclen (the solution recommended in the article Antiseptic Solutions). Apparently they are not making that anymore, but they had a kind in that was double the strength. I considered getting this but the bottle was way to large for what I needed (about 500mls) considering it had to be diluted down to 1 part solution, 80 parts water. Should I continue on with betadine, or are there any other brands you recommend? Do you still think it is an injury? Or bumble foot? Anything I should be doing but am not? 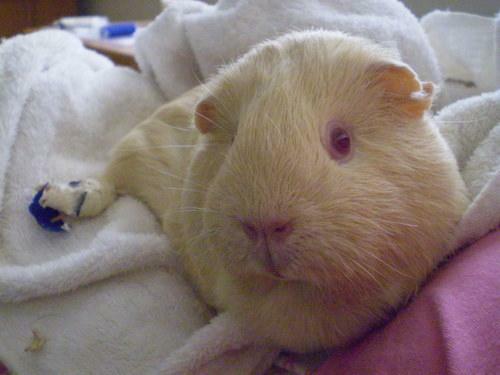 I gave Buttercup her antibiotics and pain relief and she took them wonderfully. Overall she has been somewhat quiter than normal, but everything else remains a-ok. I do think that her foot is more swollen than yesterday. The only real difference is that there is no more crust, which came off when I soaked her foot yesterday. I am starting to question as to whether it is Bumble Foot. It is rather queer to get it on her toe. 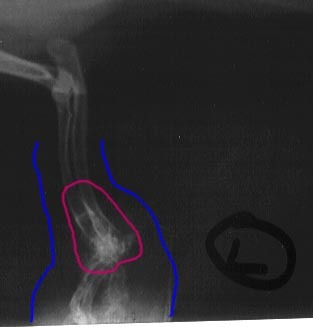 I think I will continue with the current treatment plan - it cant hurt - and review and possibly get a x-ray next week. What do you think? Good pics. Let me know if I can add some to the thread. I wonder if your pig got a spider bite on the toe or something. You can add as many as you want to the thread. A spider bite. Hmm. That is a possibility I suppose, although we only really get daddy long legs inside and they are harmless. If it is a spider bite is there anything else I should be doing? Someone else also mentioned to me that it looks like a fresh break in her toe. I suppose the most important question is, do I need to take her back to the vet now as a pose to next Thursday? It would improve slowly on its own if it were a bite. I hope it is. An xray might show a break (yes, another decent possibility). A break would also heal on its own in that location, most likely. Here is a collage which shows the picture I took yesterday (on the left) and the picture from last week (on the right). You can see the swelling has come down somewhat in the bottom area of her toe, but still remains almost as swollen in the top area and her nail. I am wondering if this has been present for some time and you just noticed it. Why? Because the nail itself is wider. p.s. I forgot to add your pics (thanks for saying okay). I'll go add them now. I may be off base, but I've had pigs with toes that looked like that before. I always thought it was fungus, and applied an over the counter medication like monistat. It is bumble foot. It has gone to the bone. The vet decided to take a x-ray. It showed that the top 2 digits of her middle toe are swollen and infected (dont quote me on this, this is the way I understand it). Even my untrained eye could tell that it wasnt right. I decided to amputate. In the end the bumble foot would only spread, she would end up loosing more of her foot and it would cost more. She quoted me about $200 - going on a previous patients bill. That combined with $200 from last weeks appointment, $100 from this weeks, and then next weeks. Needless to say it is getting pricey. I will drop her off Tuesday morning. She will have breakfast with the girls first. I will make little baggies of pellets and some vegetables for afterwards, and will take some hay along. I figure if she is kept on the diet she is currently on it will help prevent an upset tummy. I am very worried about how she will recover from the anesthetic, especially if she is a heart pig. Did you discuss the location of the leg removal? It is important (in the experience of people here) that it be far up the leg so the pig does not use the stump to walk on and it can heal. Any chance you could post a pic of the xray? I think Josephine put up a pic of bone that had become infected. Maybe I can find it. She is only amputating the 2 infected digits I think. Certainly not the whole foot/leg. Should I ask her to amputate the 3rd digit that isnt yet infected? I didnt get to keep the x-ray. I am certainly no expert. If your vet feels it is very localized and removal of a couple digits will keep it under control, perhaps that's the way to go. I think I will ask her to remove all 3 digits (digits was how she explained the 3 different sections) on that toe. Just to be on the safe side. I will certainly talk to her again on Tuesday morning. 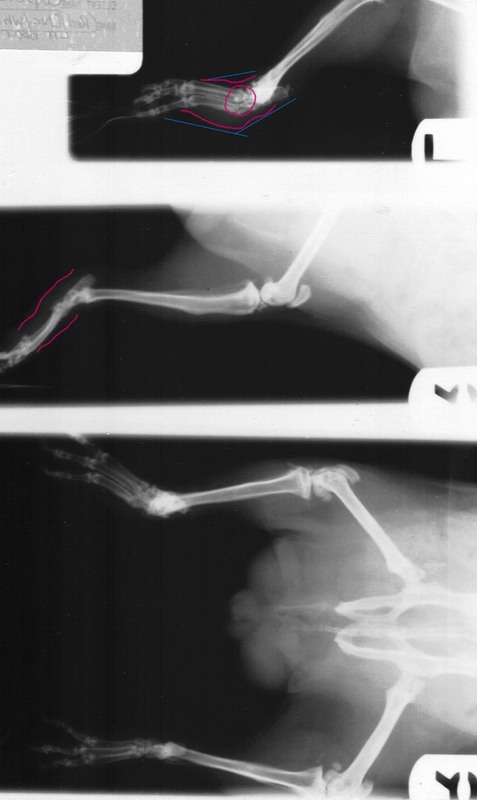 Question to all - As far as we could see on the x-ray (had a bit of trouble getting a good x-ray as she wasnt sedated although the vet said she was very close to sedating her! 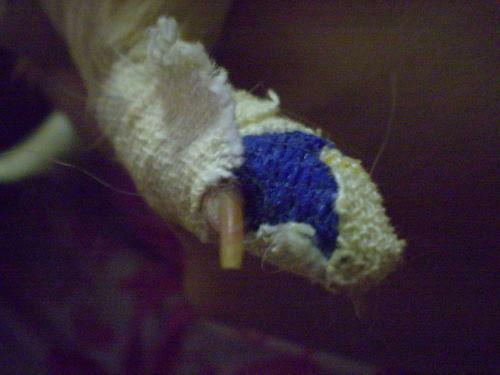 ), only the top 2 sections of the toe are infected. How much do you think should be removed? She said that we had caught the infection early. She has seen several other cases where it is full blown and mid way. The Dr I see wont be doing the operation. Dr Vickeridge will be, with my Dr watching on and assisting where needed. I am close to suggesting that they knock her out, take another x-ray and work on that as to how much they need to cut off. But another x-ray will cost me $60. I am just setting up Buttercups hospital cage (wont have any time tomorrow, or on Monday so I might as well do it now). I am using the carrier, which is large. I will line the bottom with 3 towels, then put some anti-slipping mat on top. The anti-slipping mat was recommended to me by a friends vet. Apparently she swears by it. I have a small water bottle, a food bowl and a hay rack. What do you think of the set up? I can get some pictures if it helps? I have been thinking and I honestly dont know how it has spread. She had her metacam and antbiotics on the dot, everyday. We did not miss a dose. We bandaged the toe appropriatley, and this was changed once a day and soaked. I am now wondering whether taking off just the 2 digits will help and whether even more should be taken off? Gah I am such a worry wart. I would hope your vet would make sure only one surgery was needed. Ask her whether another xray is needed to ensure it is all removed.